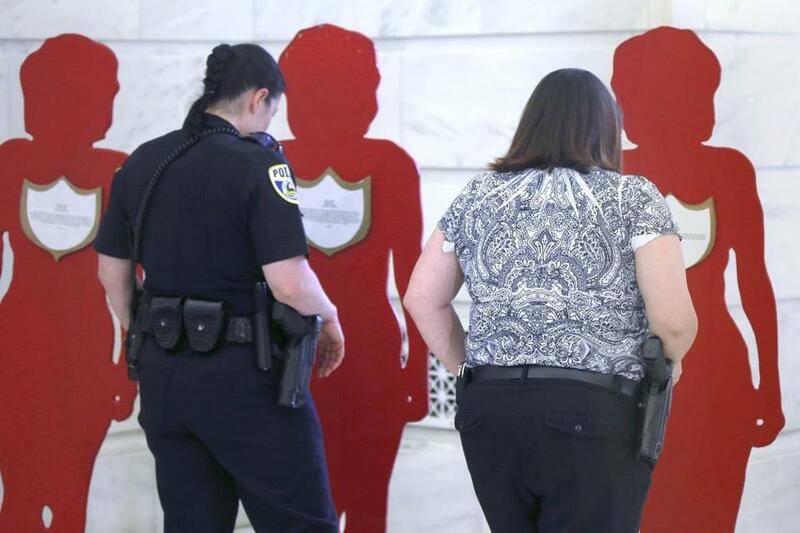 Members of the Sherwood, Ark., police force read accounts of domestic violence placed on painted cutouts in Little Rock last month. Had he walked into a Houston movie theater, pulled out a gun, and murdered six children and two adults, David Conley’s shocking crime would have ruled the national conversation. There would have been interviews with stupefied relatives and neighbors, questions about his mental health, debates about gun control, and whether movie theaters should offer better security. Instead, because Conley broke into a Houston home earlier this month and killed his former girlfriend, her six children, and husband, the public response has been more muted. Yes, there’s horror, but it also seems people can’t muster the same level of outrage toward a man who murdered a woman for having the audacity to get on with her life. Linda Ellerbee, the award-winning TV journalist and documentarian, once wrote — and I paraphrase — that the media reports news, not facts. So, even after 12 people were murdered in a Colorado theater three years ago, and two women were shot to death in a Louisiana cinema last month, mass shootings in theaters are (thankfully) still rare enough that they qualify as news. That’s likely why an attack this month in a Nashville theater, where only the assailant died and no moviegoers were seriously injured, still dominated the news for several days. Such events, regardless of perceived frequency, are still considered an aberration. A woman murdered by a man she intimately knows, however, is a deadly daily fact. Nationwide, three women are killed a day by a current or former male partner, according to the National Network to End Domestic Violence. Between September 2001 and June 2012, nearly 6,500 American troops were killed in Afghanistan and Iraq; during that same period, more than 11,700 women died in acts of domestic violence. So far this year, there have been more than a dozen such murders in Massachusetts, according to Jane Doe Inc., a statewide coalition against domestic violence. And, too often, children also die alongside their mothers. Early last month, a South Carolina man killed his wife, son, and his son’s girlfriend before turning the gun on himself. A few weeks later, a Modesto, Calif., man was charged in the murders of two women and three children, ranging in age from six months to 6 years old. The suspect’s former girlfriend, Dr. Amanda Crews — a Boston University graduate — and their infant daughter, were among those murdered. Yet outside of the communities where the deaths occurred, few took notice. When such crimes happen, law enforcement officials often say the public is not in danger. It’s meant to allay fears, but the insinuation is that since this is a case of domestic violence, no one else needs to be alarmed. It ignores the fact that we’re likely to know a woman victimized by a current or former male partner. If you’re a woman, you have a greater chance of losing your life to domestic violence than to a gun-wielding stranger in a mall or a movie theater. With that gaggle of Republican presidential candidates pledging to weaken (if not outright eliminate) abortion rights and health options for women, the term “war on women” has been getting a lot of use again. But in regards to domestic violence, what’s happening in communities across America is, literally, a war against women. We fret about terrorism and mass murders in public places, though violence against women claims far more victims while receiving a fraction of the attention. It cuts across race, class, religion, and every other demographic line, and is as much a repulsive trait of our national character as racism. With each lethal encounter, there are just as many imperishable scars — children dead or orphaned, families and friends shattered. Every day these women are dying among us; we owe them more than makeshift memorials and weary resignation. Renée Graham writes regularly for the Globe. Follow her on Twitter @reneeygraham.